Every single food blog I read is pumping out Thanksgiving recipes. I am not cooking my own Thanksgiving meal but am eating with a friend's family, thus cleaver ways of reinventing Thanksgiving classics are not occupying my mind. 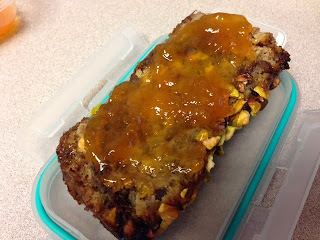 That is why I am posting recipes about meatloaf and banana bread. It's not very festive. 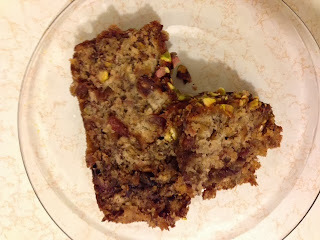 Bananas seem a little inappropriate in the winter, as they are tropical Where I live we do not have access to locally grown bananas anytime of the year, so I say winter is as good a time as any for banana bread. The basic recipe came from the blog Simply Recipes. 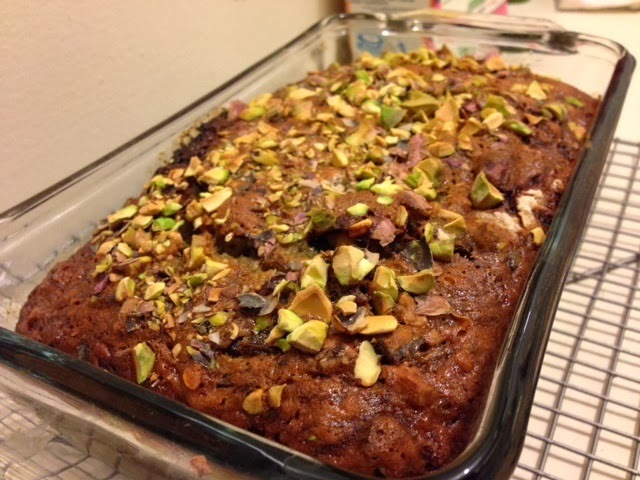 I added dates and pistachios because I'm cool. 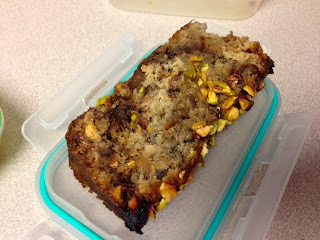 The ingredients are 3 ripe bananas, 1/3 cup melted butter, 1 cup sugar, 1 egg, 1 teaspoon vanilla, 1 teaspoon baking soda, 1/4 teaspoon salt, 1 1/2 cup all-purpose flour, 1/2 cup dates, and 3/4 cup chopped pistachios. I mixed the bananas and melted butter together. I eventually had to break out a fork to mash. I added the sugar, vanilla, and egg. I stirred until a glossy, slightly lumpy batter formed. I added the flour, 1/2 cup of the pistachios, and finally chopped dates. I bought the pistachios in shells. It was the cheaper choice, but shelling pistachios is a total pain. I sprinkled. This is the reaming 1/4 cup chopped pistachios. This was one of my favorite parts of this bread, so don't forget this step! I then baked for 60 minutes at 350 degrees. I ate my bread with apricot jam. So scrumptious! How often do you use the work scrumptious in your life? You probably don't use it enough. The dates are little sweet morsels hidden throughout the bread. 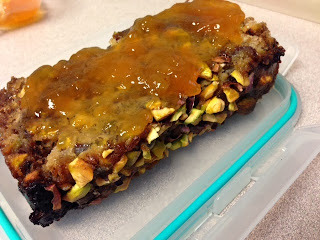 As a mentioned before, my favorite part was the pistachios sprinkled on top. You can see in this picture how much wonderful texture this bread has. It's a crunchy, sweet, and moist flavor adventure! This picture is screaming, "Eat Me!" 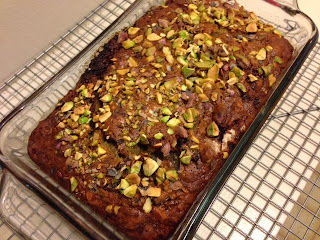 This looks super good and relatively easy for a novice baker like myself! Love dates, bananas, AND pistachios haha. Thank you for sharing. Nice blog! I eat bananas and banana bread year round. Adding dates and pistachios is a great idea! Thanks! It was super easy.